Would UK bloggers get the same support as Iranian ones? God bless the internet. As shocking events in Iran continue to unfold, bloggers, Twitter users and social networkers are helping oppressed Iranians fight the power. Even Google is helping: YouTube is showcasing videos from inside the country, while Google's Citizentube blog tells Iranian activists how to circumvent government filtering. Meanwhile newspapers are publishing as much inside information as they can, determined to fight censorship and speak the truth. Brilliant, isn't it? But if the bloggers were in the UK, the newspapers and tech firms wouldn't be on their side. If there's money to be made, new media and old media alike will happily help Goliath give David a battering. The Times has been doing a pretty good job of outing anonymous bloggers, and most recently its pursuit of police blogger Nightjack has led to a rather chilling High Court verdict by Mr Justice Eady. 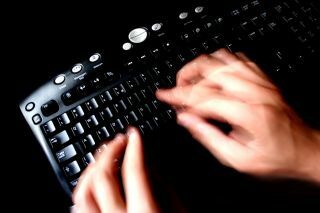 Blogging is public, and therefore bloggers have no particular right to anonymity, Eady ruled. In fact, unmasking them is "in the public interest". Was Nightjack passing on secrets to terrorists? Nope: he was criticising the police. According to Justice Eady, "It would seem to be quite legitimate for the public to be told who it was who was choosing to make, in some instances quite serious criticisms of police activities and, if it be the case, that frequent infringements of police discipline regulations were taking place." In other words, never mind the allegations: let's get the grass! Whether by accident or design, The Times' desire to run a good story has created a legal precedent that effectively abolishes bloggers' right to privacy. And the tech companies? The same Google that's encouraging Iranian dissidents to avoid government filtering and post on YouTube censored its search results in China: given the choice between making money and fighting The Man, Google chose money. In a fantastic statement, Google told the press that "while removing search results is inconsistent with Google's mission, providing no information… is more inconsistent". And of course there's Yahoo. As former FT journalist Tom Foremski points out: "Unlike other Silicon Valley companies, such as Google [and] Cisco Systems, that escaped a lot of criticism over their China policies, Yahoo got caught red-handed when it handed over information to the Chinese government that led to a 10-year prison sentence for Chinese journalist Shi Tao." Don't get us wrong. It's great that old media and new media are helping Iranian dissidents, and we're sure that everything's happening for the noblest reasons. Truth is much more important than money, and we're quite sure that if the UK government were to go nuts, the tech firms and media giants would be doing exactly the same for UK dissidents that they're doing for Iranian ones. Of course they would. Wouldn't they?